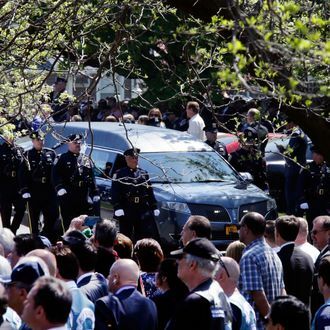 An estimated 30,000 gathered at St. James Roman Catholic Church in Seaford, Long Island, this Friday for 25-year-old NYPD officer Brian Moore’s funeral. Moore, who had been on the police force for five years, died last week after being shot on duty. The streets outside the church were lined with police officers, some who had come by the busload from as far as Louisiana. “Brian Moore represented the best of New York City,” Bill de Blasio said at the service. He added later, “He did everything a good police officer was supposed to do.” De Blasio, whom police officers turned their back to at another funeral service for killed police officers last year, said yesterday that his relationship with the NYPD has improved — although his recently proposed budget, which would add no additional police officers to the force, may challenge that characterization. New York Police Commissioner William Bratton, Representative Peter King, and the family of Detective Wenjian Liu, who was killed last year, also attended the funeral. Bratton remarked that he had been to too many of these funerals, and that he remembered them all. Moore’s wake yesterday afternoon was also attended by massive crowds, including New York Governor Andrew Cuomo and Secretary of Homeland Security Jeh Johnson.